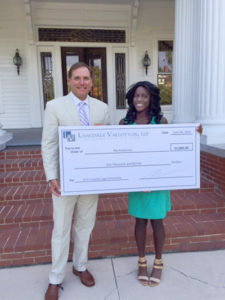 On June 28, 2016, Pope Langdale of Langdale Vallotton, LLP awarded the Langdale Legal College Scholarship to two graduating seniors, Motunvolaolu “Mo” Asebiomo from Valdosta High School and Kellsie A. Davis from Lowndes County High School. 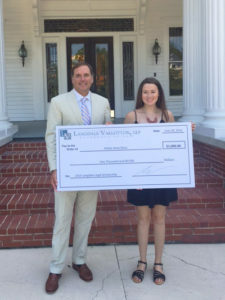 The Langdale Legal College Scholarship is awarded each year to graduating seniors who have excelled academically and who have shown a genuine interest in pursuing a legal education after high school. To be eligible, a student must have demonstrated plans to attend an accredited four year college. The scholarship is intended to further the education of deserving students with the hope that one day they will return to our community to serve our citizenry in a field related to the law. Each student will receive $1,000 to be applied toward his or her costs of attending college. In August, Kellsie A. Davis will attend University of Georgia and plans to major in Political Science. Langdale Vallotton, LLP congratulates Mo and Kellsie and wishes them the very best of luck.